This month’s edition of Performance Counts is from Office Manager and Shop Assistant Jessica Konigsberg. To read more posts from Jessica, click here. To read past editions of Performance Counts, click here. At Esther’s Place, we hope to provide that personal touch to your JMM experience—the opportunity to slow down and reflect on the exhibits and tour and find special items to take home with you so that you might continue that spark of curiosity with a great book, treasure that moment of connection with a personal memento, or relate a favorite story to a loved one via the perfect gift. 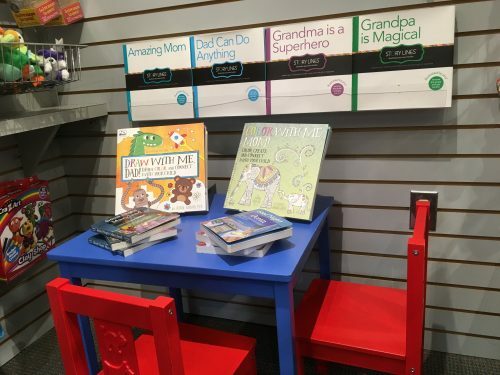 After starting 9 months ago as JMM’s Shop Assistant, it has been my great pleasure to get to know the stories that make a JMM experience meaningful and the products that capture our visitors’ imaginations—or even just make them laugh. 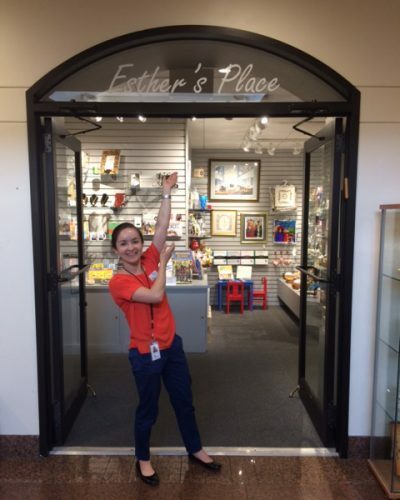 So I was delighted to write this month’s Performance Counts and to take a deep dive into the Gift Shop to discover our visitors’ favorite Esther’s Place stories and how we at JMM been evolving and growing to meet these needs. What stories have been shared or suggested, requested, or unexpectedly beloved this year in the Gift Shop by our valued visitors? To answer that question, let’s look at some of the top sellers (by quantity) from the previous Jewish calendar year! In the past year, we’ve held many book talks, making for an especially engaging and edifying year of stories, ranging from beloved tales of Jewish Baltimore to the cultural contributions of Jewish punk music to the intriguing career of Harry Houdini. Our top-selling title for the year is new Jewish Baltimore history book, On Middle Ground: A History of the Jews of Baltimore (by Eric Goldstein and Deborah Weiner) with an impressive 72 copies sold since the book’s release in April. Our next best seller, at 40 copies, is our favorite quirky Judaism primer, Did Jew Know by Emily Stone. 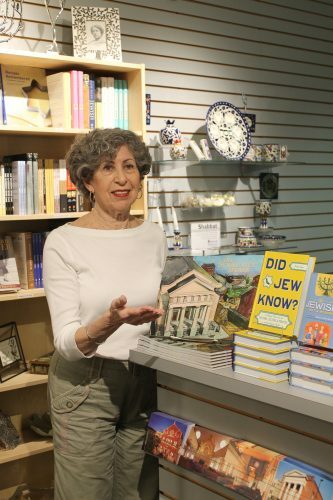 The suggestion to carry Did Jew Know in the Gift Shop came to us from volunteer docent Howard Davidov—just one example of the valuable contributions our volunteers make to the stories of Esther’s Place. In third place on our bestsellers list is the charmingly-illustrated children’s book, I Dissent: Ruth Bader Ginsburg Makes Her Mark by Debbie Levy, illustrated by Elizabeth Baddeley; with 34 copies sold, I’m delighted to know we are collectively uplifting Jewish women’s stories and sharing them with younger generations. While performing inventory this year, I became deeply acquainted with our Gift Shop’s astounding supply of JMM catalogs and publications—a treasure trove of knowledge, research, and uniquely-JMM stories, photos, and ephemera. 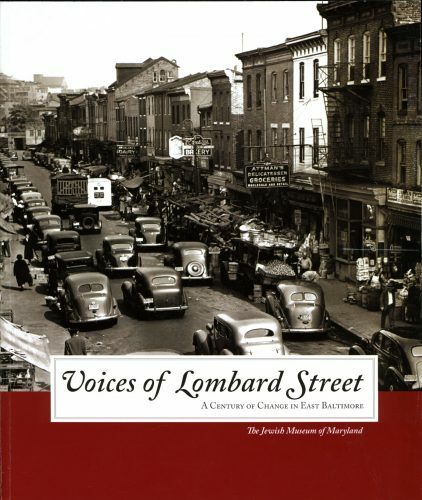 It came as no surprise that our best-selling JMM publication was Voices of Lombard Street—a truly evergreen story that so many of you have chosen to take home, share, and re-visit through this beautiful catalog. We sold 29 copies in the past year. In April 2018, we developed a special display and social media campaign around our many whimsical mugs and our staff’s collective love of coffee and tea. The display is titled But First Coffee (or #ButFirstCoffee), and the social media campaign utilizes the hashtag #MugShotMonday—a Monday social media tradition. To date, we’ve shared 19 #MugShotMonday posts on Twitter and Instagram (and many on Facebook too), each one involving artful arrangements and heartfelt tributes to the caffeinated beverage. 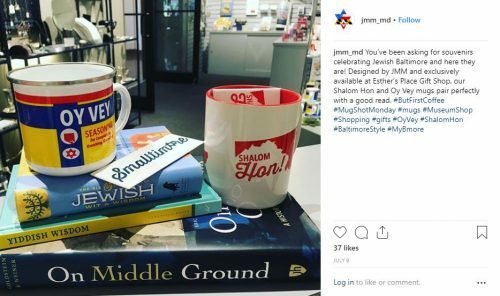 This year, we also worked particularly hard to respond to a frequent request we had been hearing in the Gift Shop—the request for custom Maryland or Baltimore Jewish products. 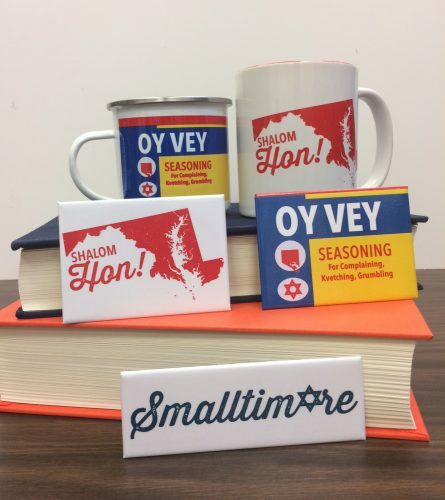 After introducing our line of See America products featuring the Lloyd Street Synagogue in January, we developed the humorous and uniquely-Baltimore mugs and magnets pictured here. Our most popular product so far is the “Oy Vey Seasoning” magnet with 51 sold, each one helping to share the story of German Jewish refugee Gustav Brunn’s Old Bay Seasoning invention and its famous Baltimore origins. 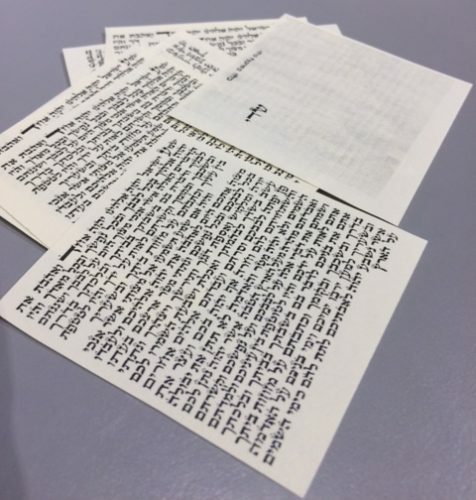 Later this month, we expect to welcome our latest custom offering into the Gift Shop—postcard sets featuring Upstanders, Athletes, and Pets from the Collection of the Jewish Museum of Maryland. While many of our bestsellers were easy to predict, several products delighted us this year with their unexpectedly warm reception. 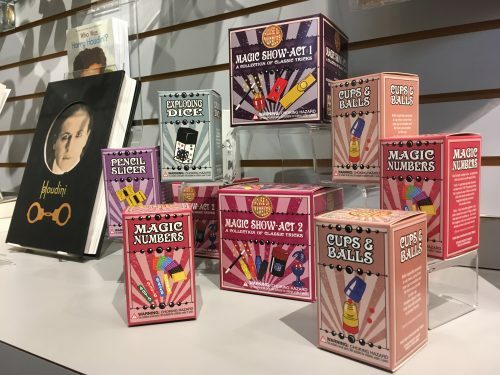 The most striking was our selection of magic tricks, merchandised in connection with our exhibit Inescapable: The Life and Legacy of Harry Houdini (currently on display). From the exhibit opening on June 24 through to Rosh Hashanah 2018, we sold 82 individual magic tricks and 24 magic trick sets—and no doubt contributed to countless home magic shows and budding magicians. Many of you ordered Esther’s Place merchandise from afar, and we were delighted to send our products and stories as far as California, Arizona, and even Germany this year. 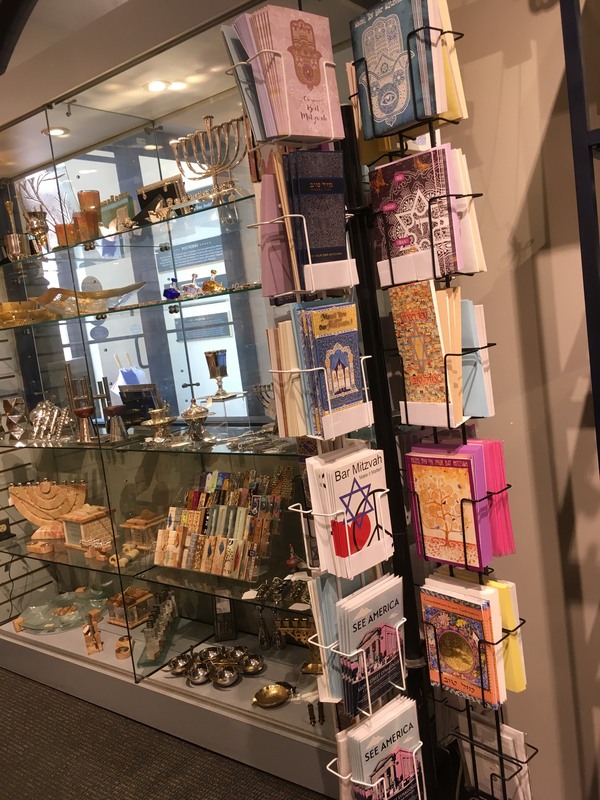 To place phone orders and have products shipped to you, please call us at Esther’s Place at 443-873-5179 or email jkonigsberg@jewishmuseummd.org. We look forward to another year of unforgettable stories, products that make us smile, and the invaluable input of our valued visitors, volunteers, and Esther’s Place customers. 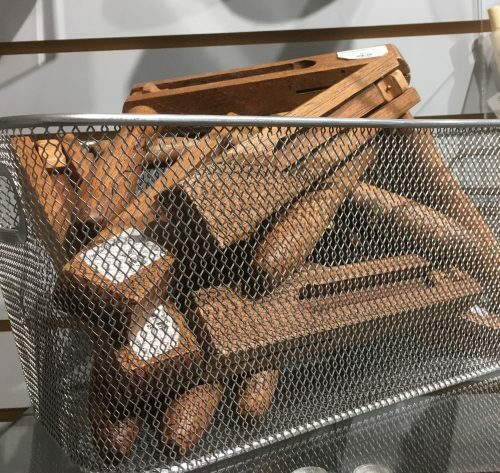 One of my favorite comments from Gift Shop visitors is the observation that the Shop is ever-changing and dynamic with something new to see whether you visit once a year or once a month. I take pride in this feedback because there is much behind-the-scenes work that goes into our changing displays and merchandise. Much of this effort is led by JMM’s Deputy Director Tracie Guy-Decker, who works hard to develop new custom products, meet with vendors, and develop creative merchandising ideas such as our “But First, Coffee” sale. But so much of the day-to-day rearranging and creative merchandising is done by our wonderful Esther’s Place volunteers. They are the ones who help me create new displays, and tackle daunting organizational projects such as fixing inventory issues and re-arranging boxes and merchandise in shop storage. Long-time Esther’s Place volunteer Maxine Cohen recently took on the re-design of our free, non-kosher, mezuzah scrolls. In addition to our new scrolls, we also have many new mezuzot in the Gift Shop and volunteer Robin Kaplan has played an integral roll in merchandising these new items. 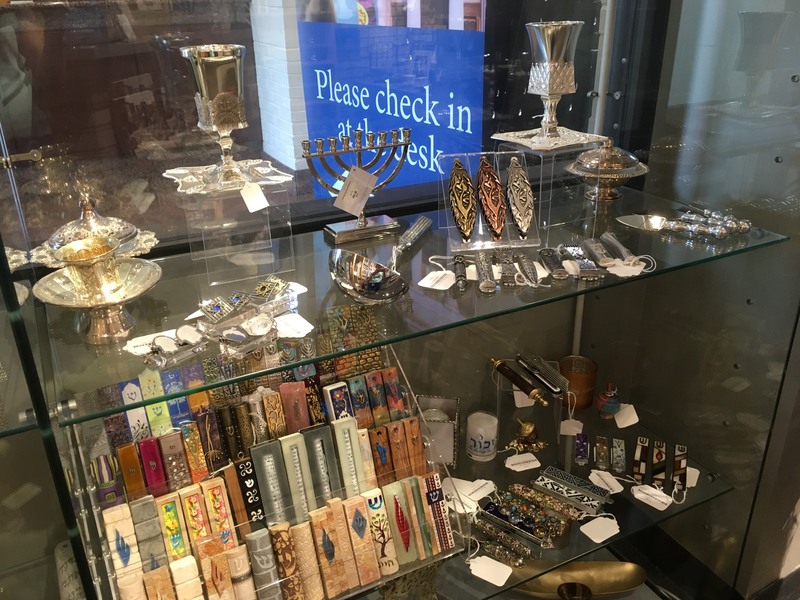 Whatever your price point and personal tastes, I’m sure we can find the perfect mezuzah for you and this is all thanks to the volunteers who help me keep up with the constant flow of new inventory. Volunteer Laraine Fisher also helped merchandise this display, adding our new selection of tallit clips, while former volunteer Doreen Eisenberg lent a hand to our display of anodized mezuzot. Robin also helped develop our Shavuot display a few weeks ago, somehow maximizing the small amount of shop real estate available (no easy feat!) during this busy time when our Amending America exhibit merchandise was also on display. Robin also merchandised our new supply of greeting cards. 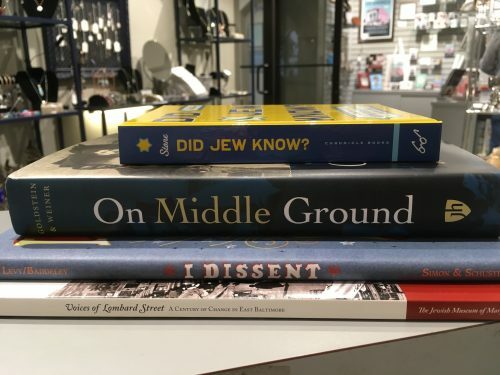 Volunteer Rachel Jablon ran the Gift Shop during one of our busiest public programs of the year so far: the launch of new book On Middle Ground. At that program we sold over 40 copies of the book. Also, Rachel frequently gives the most detailed and thoughtful explanations of the various books and Judaica on sale for our inquiring customers. Volunteers Laraine Fisher and Jacob Davenport help with much of the attention to detail and day-to-day organization of Esther’s Place—everything from refining shop systems and inventories and managing records to keeping our display supplies organized and accessible to both myself and our program/education staff. Laraine also recently updated our children’s reading corner to feature our book titles for little artists and makers. At Esther’s Place, we are here to share in your excitement and discovery as you experience the Museum, to help spark your curiosity in Judaism and Jewish history, and to help you find beautiful and special mementos of your visit. I simply could not work towards these goals without the Esther’s Place volunteers – thank you! At the beginning of the month, Deputy Director Tracie Guy-Decker and I embarked on what I’ve learned will be our bi-annual adventure to the NY NOW gift show in New York City. The gift show serves as an opportunity to meet and reorder with existing vendors and to discover wonderful new vendors and products that could enliven our Gift Shop offerings. The gift show was an exhausting and productive experience where we ordered a range of beautiful and inspiring new Judaica, books, games, and gifts. But more on these items in a future post—today’s post is all about the delightful (and noisy!) new products we picked up for the upcoming Jewish festival of Purim. This year, Purim begins the evening of February 28 and ends the evening of Thursday, March 1. 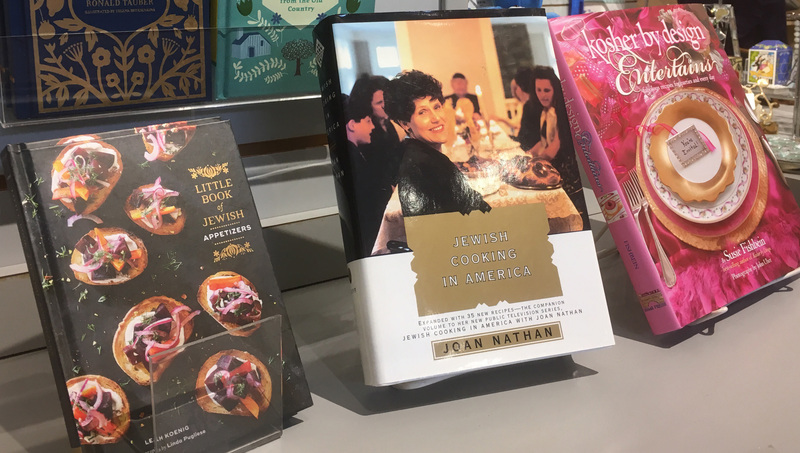 Purim encapsulates so much of what makes a holiday or tradition powerful and engaging—story, imagination, and liveliness—which is why I’m so excited to celebrate the holiday in the JMM Gift Shop, Esther’s Place. Purim is celebrated each year on the fourteenth day of the Hebrew month Adar and recalls the rescue of the Jewish people from Haman, a grand vizier to the Persian King Ahasuerus during the Persian Empire. Haman was incensed when Mordecai (guardian of the King’s new queen, a Jewish woman named Esther) refused to bow to him and ordered all Jews throughout the Persian Empire killed. Esther later courageously revealed her Jewish identity and successfully implored the King to save her people. The King ordered that all Jews be allowed to defend themselves against their enemies. The story of Purim is told in the Book of Esther or Megillah, which is read in the synagogue for the holiday. Learn the story in more detail from The Little Book of Jewish Celebrations by Ronald Tauber, available at Esther’s Place (JMM Gift Shop). 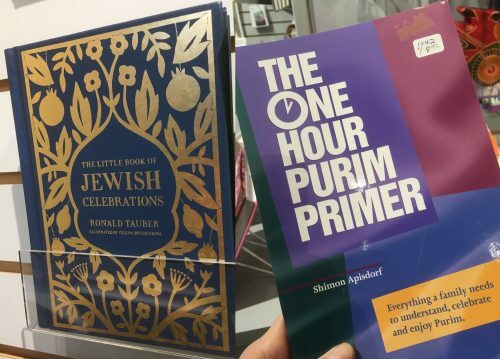 Or find a helpful overview of the holiday in The One Hour Purim Primer by Shimon Apisdorf, also available in the Gift Shop. Rejoicing and celebration are key pillars of the Purim celebration so one of our missions at the gift show was to acquire a selection of noisemakers (or “groggers”) and hand puppets to complement our existing inventory of Purim-themed dress-up items and other whimsical gifts. 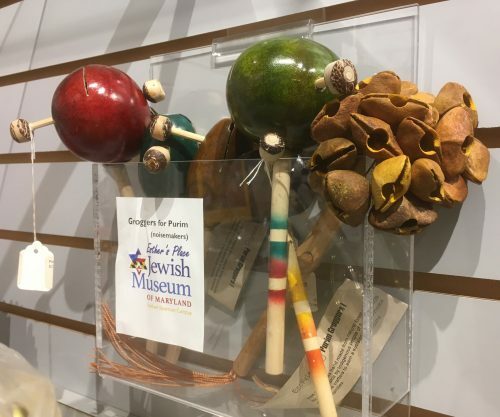 The noisemakers are used to drown out Haman’s name during the reading of the Book of Esther, and make for a fun, seasonal gift for the spirited young (or young-at-heart) people in your life. The Hebrew word for grogger is ra’ashan, from ra’ash, which means “noise” (thanks volunteer Rena for sharing this with me). We were fortunate to find several varied options at the gift show, including Haman wood groggers, “Happy Purim” brightly-colored noisemakers, and wooden pop-out hand puppets (my personal favorite of our finds because of their vintage, nostalgic feel). 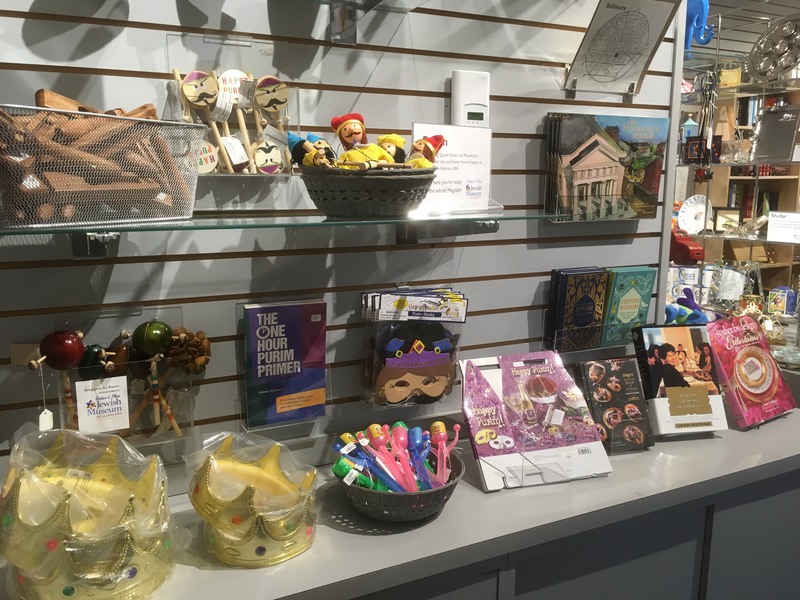 Items now on display in the Gift Shop include a wide selection of groggers, some marionettes, Purim gift boxes, and masks and crowns (which cater to the Purim children’s tradition of dressing up). We also have several great items left over from last year’s festivities, including, possibly, the noisiest of noisemakers, an elegant wood grogger. A popular food at Purim is hamantaschen, a three-cornered pastry filled (typically) with fruit and rich with potential symbolism of the holiday. The word references “Haman,” the story’s villain; “mohn,” the original poppy seed filling; and “tash,” the pocket-shaped form of the cookie—and is often translated as “Haman’s pockets.” I enjoy hamantaschen (my husband once charmed me with homemade fig hamantaschen back when we were dating) so I’m delighted to better understand their origin and find a good occasion to make them. Find hamantaschen and other recipes for the holiday in our beautiful Jewish cookbooks, and gather table-making ideas from our extensive collection of beautiful tabletop items. Stop by and share your own great traditions and recipes with us. Other traditions (in addition to the feasting and festivity) include giving to charity and giving special gifts to loved ones. 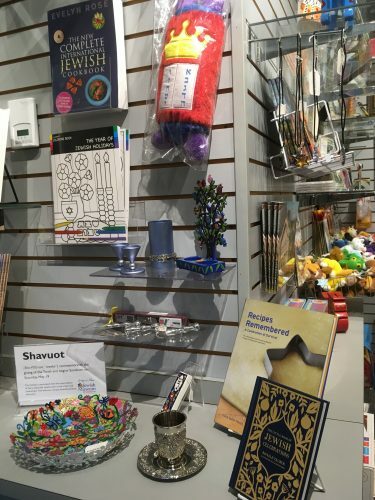 Purim is a time for whimsy, rejoicing, and celebrating the resilience of the Jewish people, and we hope you’ll find the perfect holiday gifts and inspiration at Esther’s Place. With just a few more days before the holiday, don’t delay in stopping by to pick up your Purim supplies!